Earlier this year I announced that I was going to make monthly goals/challenges for myself to complete. Some would be hard, some would be easy, but all would push me out of my comfort zone a bit. 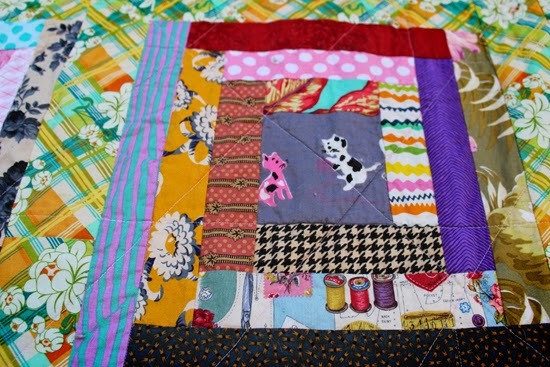 January's challenge was to make a log cabin quilt using scraps. I have always been kind of mesmerized by log cabin quilts, but had never made the time to sew one. It seemed like there would be a lot of cutting and measuring involved and I wasn't sure if I wanted to commit to a project. I was half right, there was a lot of cutting, but not so much measuring. You see, you cut a center piece (the square) which is the only fabric, besides the sashing, that is a different size. All the logs are three inches wide, so I organized my scraps into piles of different colors, grabbed my favorites, and started cutting. 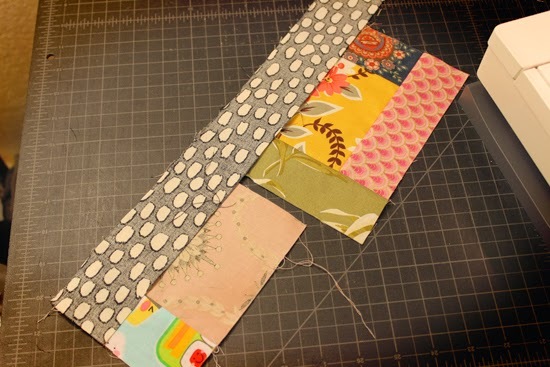 The task of sewing becomes even easier when you sew a few blocks at the same time. What I mean by that is you get a few center pieces with different fabrics strips and sew the first logs on. Then you get a new center piece (the square) and a block that already has a log on it and sew the square's first log and the block's second log at the same time, using the same fabric. Depending on how long the fabric strips are, you can get quite a few done at one time. Did I totally make that sounds more confusing than it is? You're basically chain stitching different blocks at the same time and making sure the logs have some variety in color. I debated on what to do with the sashing. 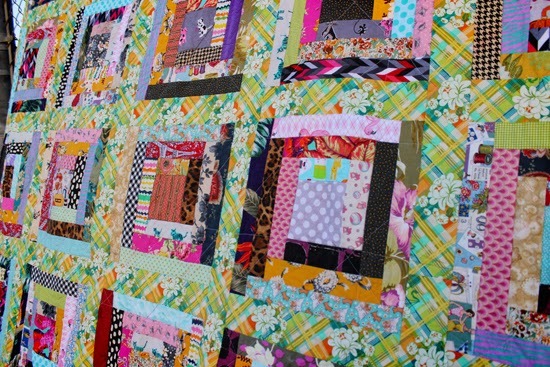 If I pieced together the fabric from my scrap bag the quilt might end up being a little on the crazy side. Or the crazier side if some of you think it's crazy the way it is now ;) In the end I decided to cut into fabric that I had been hoarding because the print was a good contrast and because there were three yards of it. Technically, I didn't buy it for this project and it wasn't a scrap from a previous project. The only thing purchased with this quilt in mind was the batting. The pattern used was from the book Modern Log Cabin Quilting: 25 Simple Quilts and Patchwork Projects * and it won't be the last time you hear me mentioning it. I plan on making the quilt on the cover with the Liberty fabric I have been saving from my trip to England. The finished product is 84 inches x 84 inches, the biggest quilt I have made, and I won't lie, I struggled with it. When it comes to following a pattern I have no problem, but free styling without a pattern is more stressful to me. For some inspiration I took the Creative Quilt Backs Class* and was happy with how it went. To be honest, I didn't watch all the lessons, but the ones I did watch were helpful in planning out the back and helping me get the angled and mismatched look. My biggest regret was not angling all the pieces because they look cool that way! There are some definite flaws though. Along the top back the fabric was different lengths (should have trimmed everything down :( ) before sandwiching everything together. When I taped it down there were different tensions throughout which meant a few sections weren't pulled taut enough. Because of this there are wrinkles. I'm not losing sleep over it though. The suggested quilting was maybe ten or fifteen lines on the diagonal. I started there, but it didn't seem like enough to me, so I quilted across the blocks and stitched in the ditch for a few rows. 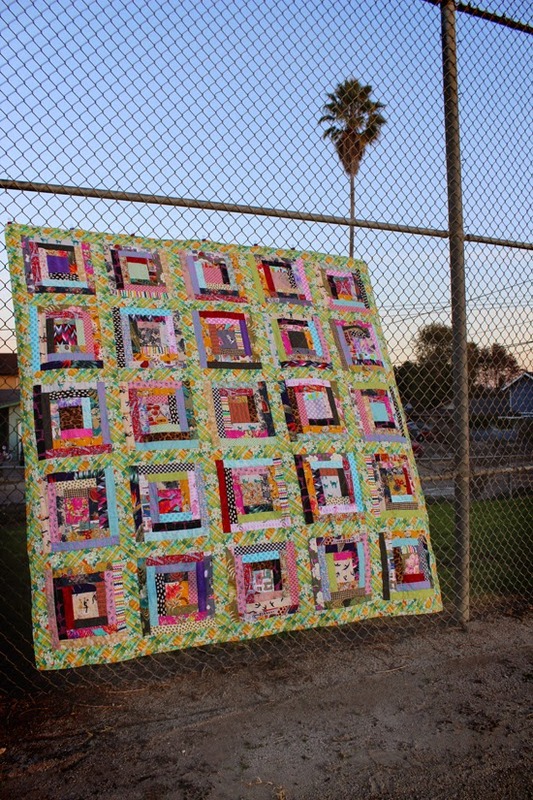 In the future I would like to try some free motion quilting even though it intimidates me. So, I know this is going to make me sound like a total cheese ball, but when I look at my quilt I get such a sense of fulfillment. It took a LOT of time to make and it's full of memories. When it was being sewn I would look at all the different fabrics and remember who they were meant for originally. There are bits of the first quilt I ever made which was for my grandma, pieces from grocery totes I sewed my friends, and scraps from some of my early garment sewing projects. The quilt is laying on my couch and it is something that I see everyday. It makes me really happy when I look at it. Are there any other quilters out there? 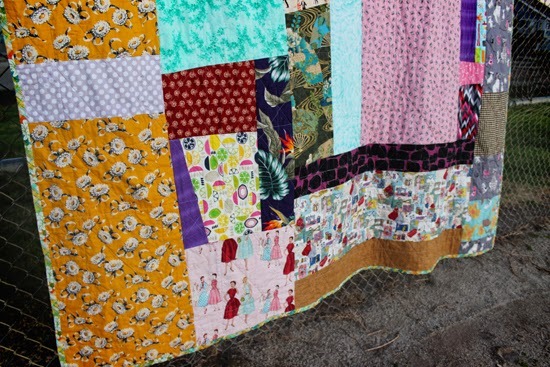 Do you have any favorite quilting blogs that I should go lurk? *Heads up, this is an affiliate link. If you click the link and buy something I will get a percentage of the sale. I promise to use any money that I make and put it back into buying new sewing or knitting books for myself :) I promise! Huge congratulations on accomplishing your first goal! Erin, this quilt is absolutely GORGEOUS. I love all the bright colors you used and the scrappy back, and I really love how you also chose a bright color for the sashing. I'm so impressed that this is your first quilt, and I'm happy to hear that you're getting so much use and enjoyment out if it already. Looking forward to following along with more of your quilting adventures! Thanks for the kind words, Carolyn! This isn't really my first quilt, but it's my first log cabin quilt and the first quilt I have kept for myself :) I love it so much, there will be many more in the future! Wow! This looks so, so cool! 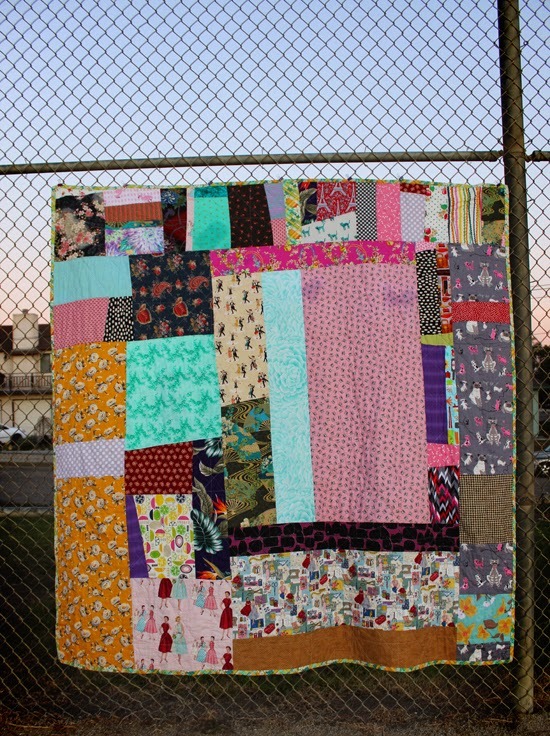 As a new quilter, I totally appreciate how much work went into this! It's really, really fun. It's beautiful Erin!!! It makes me happy looking at it! What an incredible work of art! I am in awe and have quilt envy! this is such a work of art! and i totally feel you on that last paragraph, that's one of the things i love about quilting! That doesn't sound cheesy! My first "real" quilt is full of soooo many flaws, but I'm still so proud of it. My second is less flawed (but still has some mistakes), but I couldn't be prouder of it. Lots of time and love goes into them, it's awesome to get to feel that again every time you look at it. I know I've told you a million times already but I LOVE THIS SO DAMN MUCH!!! ...I mean seriously. It's so amazing. I want to make one! Welcome to the world of quilting, oy is your fabric stash going to grow! Some fabrics can work for garments and quilts, but many can't which means a growing stash. I love what you did, so bright and cheery. and yes, the sashing makes it look like the log cabins are all sitting in a meadow - ties things together while still staying scrappy. Dude!! You are so awesome!! This is sooo great! you should be soooooo proud. it is awesome!!! This is such an accomplishment! You should be SO proud! 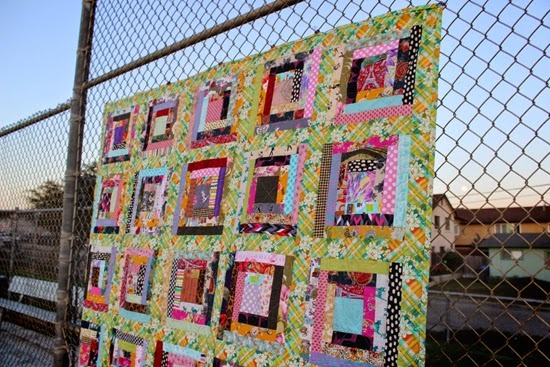 The quilt is just beautiful - it's like a party for the eyes! This looks fantastic, congratulations! You should definitely feel proud. I made a quilt for my friends who got married last summer and had so much fun putting it together - like you say it's like going down fabric memory lane. One day, possibly when I have my own place, I might get round to making one for myself. Hope you get many years of enjoyment from your quilt! Wow, this is such a feat! The quilt is beautiful and so unique! Yay!!! What an accomplishment!! And you used up scraps, too,so that's always great. :) I love it!!! It looks so great!!!! I made a quilt a few years back and have one currently in the works. Nothing too complicated like a log cabin quilt, but still I was very proud of it. If you're interested in quilting then I recommend giving a log cabin quilt a try. It's not difficult to sew together and if you're looking to get rid of scraps it is a fun way to reuse. Thanks, Jo! I don't think you need to wait for your own place, you should make one now if you want to! I can't wait to see your finished product!! A compliment from you means a lot to me. Thank you, Leah! You should make one, Sarah! I bet you have the coolest scraps from all your pretty garments! I think I love the quilt back more than the front! I would call it "reversible" and display the hell out of it. Ironically, I don't have the patience to quilt! Hey Erin! I'm only just catching up with my commenting but I loved this quilt! I really think a bit of black makes multicoloured things pop so this makes my heart sing! One of these days I'd love to get involved in quilting. A future goal!